My favorite character in the Phantom Tollbooth is Tock. Milo met Tock in chapter two which was when Milo was in the Doldrums. Milo's interactions with Tock was that he said things, such as killing time, which made Tock angry since he was a watchdog who loved time. Tock said, "KILLING TIME! It's bad enough wasting time without killing it." After he said that he shuddered at the thought of it, which tells that Tock cares for time very much. Some characteristics for Tock is that he is a watchdog, who always goes tick-tick-tick all the time. His name is Tock, which is a weird name for a dog that goes tick-tick-tick. Tock's name is that because when his brother was born, Tock's parents were overjoyed and immediately named him Tick, because they were sure that he would go tick-tick-tick. But when Tick was born, he went tock-tock-tock. The parents went to the Hall of Records to change his name but it was too late. Then, when Tock was going to be born, the parents knew not to make the mistake again. So they named him Tock. But of course, Tock went tick-tick-tick. His parents were so overwrought that they gave up having any more children and devoted their lives to do good work among the poor and hungry. I like Tock because when he told the story of why his name was Tock, I think it was funny. Tock is still funny along the way of Milo's adventure. Again, my favorite character in the Phantom Tollbooth is Tock. I think Tock is the best character too. You have a great paragraph. Tock's not my favorite character but I still like him. For people who had not read The Phantom Tollbooth you have a good description of the character. I agree the story of Tock's name and his brother was funny also. This is a very detailed paragraph about why you like Tock. I also chose Tock as my favorite character because of almost exactly what you said about Tock! Nice paragraph, Ben! Tock is not my favorite character, but he is my third favorite character. Nice comment Ben! My favorite character in the Phantom Tollbooth is Tock. He has been a great character since the first time he came up in the book. Tock goes tick-tick but his name is Tock. He got this name because of an incident that happened with his brother. His brother made the sound tick-tick instead of tock-tock, but his parents didn’t know that till he was older. This made them give the wrong name to the pup. After this they decided to name their next pup Tock and have no more puppies. Milo met Tock in the Doldrums because he was wasting time. Tock hates people to waste time. This is why he is the watch dog. After they had met, they drove off together while thinking a lot. They drove to many places. In conclusion, Tock is my favorite character because he is smart and different. I agree Tock has been a good character since the beginning of this book. Tock is a smart character. Tock is a very funny character. Tock was my second choice. I think that the Humbug, or scientifically known as Insecticus humbugium, is the best. He looks very secretive and deceitful. That's actually what 'humbug' means. A humbug is someone who acts like something else, or an imposter. He is also very obtuse or in other words, stupid. He came out of the Sea of Knowledge completely dry. In chapter 13, it says," What a terrible mess," observed the Humbug, with his knack for saying exactly the wrong thing." He also got into a fight with the Spelling Bee and accidentally got Milo in prison for six million years, well sort of. He also 'volunteered' to go on the quest to save Reason and Rhyme. Overall I think the Humbug is the best. My second favorite character is officer Short Shrift, who is four feet and half as tall. I agree Adrian about officer shrift. He is four feet wide. No offense, but how can you like the Humbug? I agree with you on Officer Shrift though. There was supposed to be a period there. I agree with Jay's first reply. I love the Humbug. He's hysterically dumb! My favorite character is Alec Bings. Alec Bings lives in the Forest Of Sight. When Milo first met him, he was confused because he heard him but couldn’t see him. He looked around and finally he looked up. Alec’s family grows downwards so Alec Bings was still young and he hadn’t reached the ground yet. He could also see through things. He read through Milo’s plans of saving Rhyme and Reason from the castle in the air. Being able to run in mid air and to see right through stuff is awesome. Alec also taught Milo an important lesson, everyone and everything have different points of view. To me, thats the most important lesson the whole book. He showed an example which was that a water bucket to Milo was a water bucket, to an ant it was a sea, and to an elephant it was a drink. Alec was generous enough to take part of his time off to show them the colorful symphony. He also gave them a telescope that can see things as they really are. Alec Bings is is really nice and also was confused when he first saw Milo. He asked him why he grew up instead of downwards. Thats how most of the people grew in the forest. Alec Bings contributed to saving Rhyme and Reason because he gave them a telescope but also got Milo, Tock and the Humbug to cut through the Forest Of Sight instead of taking the road that went around the Forest Of Sight. Milo needed to save Rhyme and Reason as fast as he can. Alec is also constantly getting hurt because when he runs in mid air he sees the tree after the the one before it because he can see through things. There is a highly likely chance he will hit the tree he sees through. But he is still very helpful. He always got hurt but still persisted to help Milo. Right after he left the story Milo, Tock, and the Humbug had trouble with Dr. Discord and the Dynne. Alec prevented all the trouble when he was with Mil Overall, Alec is the best character in The Phantom Tollbooth. I agree Alec is my favorite character too Michael!! This is a very good and detailed paragraph Michael. I also think that Alec Bings is a cool character. Alec Bings is my second favorite character. I think it's funny how he's always getting hurt on trees. This is a big and detailed paragraph, Michael. Nice job! I like your replies Noah, Dean and Jackson. Thanks. There were very many interesting characters we read about in The Phantom Tool Booth. The character that intrigued me most was the Whether man. He was a character with a small part in the book but very different and annoying from the rest of the characters. This was an interesting active little man that is the only one always being rained on. The Whether man didn’t really teach Milo much but confused him. The Whether man also was always being rained on for some reason. This man was not great in size for he was quite small. This was the first character Milo had met when he had gone through the Tollbooth and arrived in expectations. The Whether man fascinated me in some interesting way by just how weird he is making him my favorite character in The Phantom Tollboth. I also liked the Whether Man! I like your comment Logan. The Whether man was very confusing to me. He would be interesting to talk to though! My favorite character in The Phantom Tollbooth is Tock. Tock is a watchdog that goes tick, tick, and tick. He got his name when his brother was named tick and went tock, tock, and tock, his parents did not want to make the same mistake but they did. Tock is very concerned about wasting time. When Milo was killing time in the Doldrums Tock got very mad and came and told Milo that wasting time is bad, but killing time is even worse. After that he asked if he could come in Milo’s car, because he loved automobile rides. I think Tock is a very funny character. Your comment is very detailed Kendra! My favorite character is Dodecahedron. The Dodecahedron has twelve faces for the name means a mathematical shape with twelve races. He is very smart at math, and my favorite subject is math, so he fits me very well. Well, without the faces part. The Dodecahedron is a fun character. So far, in The Phantom Tollbooth, I've loved all the characters, but I think my favorite one is Alec Bings. Milo heard a weird voice coming from somewhere unknown. Milo looked up. There he was. Alec Bings, floating in mid air! Alec and his family grow downward instead of upward. Milo met Alec in the Forest of Sight. Alec Bings taught Milo a very important lesson about how people see things in different points of view. Alec can see through, behind, and around everybody he meets. He is very strange in my opinion. When Milo first met Alec, Alec knew all of Milo's plans for the day. Imagine if you could do that! I think Alec Bings is a really cool character in The Phantom Tollbooth. I also like Alec Bings! So far, my favorite character in The Phantom Tollbooth is the Mathemagician. I like him because he taught Milo several important lessons. One lesson is that when a person has something they always want something better. The Mathemagician is very wise. However, he needs to learn how to be friends with his brother, King Azaz. Anything that one agrees to, the other disagrees. The Mathemagician has a very useful magical staff that is a giant pencil. This staff has magical powers. One of them is that he can erase a place and begin again somewhere else. Because of his awesome powers and his smart ideas, the Mathemagician is my favorite character. The Mathemagician isn't my favorite characters in The Phantom Tollbooth, but I still like him. I like him because he can be funny at times and and can be a little creepy because of what his face looks like sometimes. I have two favorite characters in this book who are Canby and the Mathemagician. I like Canby because he can be anything such as a superhero or a genius. Also if a person wanted to be a smart alec, if they were Canby, they could be that. I like the Mathemagician because of his magic staff and his subtraction stew. I like his magic staff because he can erase where he is and draw a different place he wants to be. If he had to be in seven places at once he could write 7x1 equals seven and there would be seven Mathemagicians. I like his subtraction stew because it makes you hungry and for Milo, the stew would teach him a lesson that there people should not be greedy and take too much food. The Humbug took 23 servings of subtraction stew. The outcome of eating that many portions of stew taught him not to be greedy. This is why Canby and the Mathemagician are my favorite characters of the book. I also think the Mathemagician is cool. I also like his epic magic staff. Nice paragraph, Jay! I do not have a favorite charecter in the book, instead I have multipule favorotes. I will now describe them to you. The first one that I will describe to you is officer Shrift that Milo met in Dictionopalis who is two feet tall and about four feet wide. I like him because he throughs people in jail for no reason and says that they have to stay there for a ridiculous amount of time, but has a button that the people that he caught can press to get out whenever they want. One of my other favorite character is Tock because he is pretty smart and sometimes funny. Milo met Tock in the Doldrums, a very dull and lazy place. My last character is the Soundkeeper. Milo met her in the Silent Valley. She taught Milo not to keep things for himself like she did with sound, but instead share with others. I liked Short Shrift too Melia! I liked Tock also. Tock is very funny at times, I agree. The Soundkeeper did teach Milo an important lesson. Short Shrift is my second choice. I forgot got about Short Shrift!!! I like him because he's kind of short. He is not kind of short, he is very round and super short! So far my favorite character was Alec Bings. Alec can float in mid-air. He floats in mid-air because his family is born in the air instead of on the ground. Alec can also see through things, and if someone were to tell a lie Alec would be able to see right through it, or he can also tell you what you had for breakfast, lunch, or dinner. Alec taught Milo that all things have different points of view. He gave the example of a bucket of water. If an ant saw the bucket it would be a huge ocean to it, to a fish it would be of course its home and if you saw then it would just be a bucket of water. Alec Bings was a very cool character and I think there are going to be many more characters (things) coming up in The Phantom Tollbooth. Thank you for reading and please comment! Now we finished the book. Is he still your favorite character? I like most of the characters in the book, The Phantom Tollbooth, so far. I think the character I like the most is the dog, Tock. Tock is a dog that Milo met near the Doldrums. The Doldrums is a dull place and all you do there is sleep or kill time. Tock was very mad at the Lethegarians for killing time. Even though Tock's name is ''Tock'' he goes tick. This important dog taught Milo to not waste time, and to use time. The dog is a watchdog, and that's why his name is Tock. He also has a clock on his side and it's very accurate. I'm very excited to read the rest of the book and I hope you like characters in this book as well. Thanks. Your comment is great too! :) I also liked Alec Bings. Tock is really cool. This is a good and detailed paragraph. I really like your post, Hide! My favorite character is Alec Bings. He is born in midair and grows down. His head stays up, but his body grows down. For example, he could be 3 feet in the air, then 20 years later he could be 6 feet on the ground. When he’s growing, his point of view doesn’t change. So when he’s little he has the same point of view as when he’s a grown up. Alec can see everything. He can tell you how old you are and everything else. For example, he can tell you your secrets, how old you are, what is your name, and other stuff. My favorite Character in the Phantom Tollbooth is Tock. Tock is a ticking watchdog that is always concerned about people wasting time. Milo met Tock in chapter two when in the Doldrums when Milo was wasting time with the Lethrgarians. He told Tock that he was just killing time. Tock responded, “KILLING TIME” so loudly his alarm went off. Then he said “It’s bad enough wasting time without killing it,” and he shuddered at the thought. Tock is also half animal half watch, and I like animals. Tock taught Milo to think, a lot could be accomplished with just a little thought. I also had Tock as my favorite character. I did enjoy his lesson as my favorite. Nice job, Garrett! My favorite character in The Phantom Tollbooth is Tock. Tock is a watchdog that has a huge clock on his side(thus the name watchdog). He is very nice but can sometimes be very stern. He met Milo in the Doldrums and taught him not to kill or waste time. One reason I like Tock is the fact that he is very nice but can be stern. I like this character trait because sometimes I need something that is stern to me and I also like having something that is very nice to me. I would also like to have him as a companion because he doesn't like it when people waste or even worse kill time and I sometimes need someone like that in my life. My favorite character in The Phantom Tollbooth is Canby. Whenever Canby says something like “ I am smart.” He's smart. Whenever he says he's dumb, he's dumb. The lesson that Canby taught Milo is that anyone can be anything. When Milo met Canby he asked where he was. Then Canby asked Milo who he was. In conclusion Milo said Canby can be anything. I love Canby. My favorite character in the Phantom Tollbooth is the watchdog Tock. Milo first met Tock when he was wasting time in the Doldrums. Milo's interactions with Tock was when Tock told Milo that killing time was bad. Tock loves time because he is a Watchdog. Some characteristics Tock has is that he has a stopwatch on his side. That is the reason why he is called a watchdog. He has a weird name because he goes tick tick tick all day but his name is Tock. Tock is Milo's companion. He has helped Milo throughout his journey to save Rhyme and Reason. In conclusion, my favorite character is Tock. So far in the Phantom Tollbooth, Alec Beings. I like Alec Bings because he starts growing from the sky and not the ground. Milo learned a great lesson from Alec Beings, the lesson was that people can't always look at things from someone's else point of view. Another reason I like Alec Bings is that he can look through people. That means he can tell what someone ate this morning for breakfast, which Alec Bings did to Milo. In conclusion, Alec Bings is my favorite character. Sorry I meant that so far in the Phantom Tollbooth, Alec Bings is my favorite character. Alec Bings is a great Character, even though that's not who I wrote mine on. I didn't do my post on Alec Bings too but I still like you're character a lot. My favorite characters in The Phantom Tollbooth are the Lethergarians. The Lethergarians taught milo that nothing gets done if no one does anything about it. Milo learned this because the Lethergarians did practically nothing all day and they got nothing done, which taught him the lesson. The Lethergarians are also kind of funny because of the rules they follow. One of the laws is that no laughing or smiling is allowed, and another is that no one is allowed to think in the Doldrums, the place the Lethergarians live. I think the lesson is one of the most important lessons that Milo learned, because they were basically a mirror image of Milo before he went through the tollbooth. When Milo saw them acting that way, he stopped doing that, learning from them. I think that this encounter was one of the most important in the book so far, and because of the lesson that the Lethergarians taught Milo, they are my favorite characters. Although I like Alec Bings the Lethergarians are pretty Well... BORING!!!!! My favorite character in the The Phantom Tollbooth is Tock, the watchdog with a clock in his side. Tock is my favorite character because he has a great personality. He is nice, funny and protective. Milo met Tock when he got lost in the Doldrums. Milo was "killing time" and Tock didn't like it because he is a keeper of time. Tock and Milo ended up being friends, and I am guessing they will be partners until the end of the book, since they are very loyal to one another. In conclusion, Tock, the dog with the clock in his side, is the character I've enjoyed reading about the most. My favorite character in The Phantom Tollbooth by Norton Juster is the Humbug. The Humbug is a lazy, untalented, bug-like thing that is completely against education who usually does smart things by accident. Little does he know, he is teaching all of us something: how not to act. He mentioned to Milo that the Humbug branch is everywhere; in political areas and much more. However, this represents how many people seem like they're completely and genuinely nice people, but they are actually horrible people. This is like Richard Nixon. He seemed like a great president until he committed that crime. In the ways that he is untalented and coeducational he is like Milo was at the beginning of the story. When Milo was in school he longed to be out. When he was out of school, he longed to be in. Milo never payed any attention to all his fun games and activities. The Humbug lives in Dictionopolis, where the duper smart and talented Spelling Bee lives. They highly dislike one another, and got in a fight blaming Milo for causing all the ruckus. I sort of like the Humbug. However, I completely agree that he teaches a good lesson of what not to do. He actually can be funny at times. Nice post, Jackson! I meant where the super smart and talented Spelling Bee lives. My favorite character in The Phantom Tollbooth is Alec Bings. Milo met him in the Forest of Sight. Alec Bings taught Milo that everybody has a different point of view and that Milo should respect everybody's point of view. Something I like about Alec Bings is that he is born as tall as he will be when he is grown up and then grows down from in the air. As Alec Bings grows toward the ground, his point of view doesn't change because his head stays in the same place. He was confused when he learned that Milo's point of view is constantly changing and he never sees one object the same way. Alec also has the power to look through people. For example, he looked through Milo and saw what he had eaten for breakfast that morning. This is an important characteristic because then he could maybe see people's feelings and thoughts. I think Milo was lucky to have met Alec Bings. My favorite character in the Phantom Tollbooth is Officer Shrift. His appearance and his lack of common sense made him funnier than any of the other characters Milo came into contact with. He looks as ridiculous as he sounds. He is 2 feet tall, just as wide and he looks like he could pop at any moment. He wears a blue uniform, white belt, gloves, a peaked cap, and he has monstrous hands. He and Milo crossed paths in Dictionopolis when Shrift arrested Milo for supposedly breaking some ridiculous laws. As he was arresting him he read off these absurd laws. They were; having a dog with an unauthorized alarm, sowing confusion, upsetting the applecart, wreaking havoc, mincing words, and illegal barking. He even sentenced Milo and Tock to “6 million years”. Officer Shrift’s absurd arrest of Milo and Tock along with his silly appearance made me laugh and is why he is my favorite character. To me Short Shrift is really ugly because of belly, mainly. Officer Shrift also made me laugh. I also think that Officer Shrift is funny. It would be funny to see someone that short and fat. Four feet long! 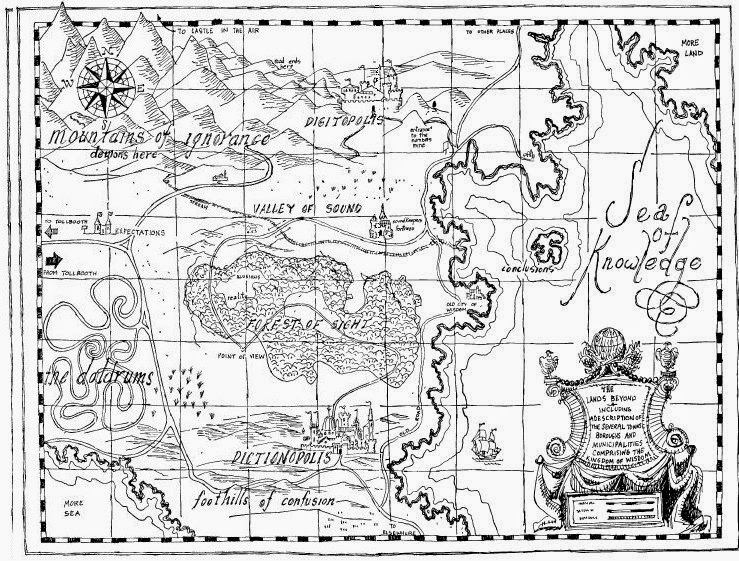 The book “The Phantom Tollbooth” is a book about a boy who is on a journey to the Tollbooth. On his journey he meets many strange people and travels to many strange places. The Phantom Tollbooth is also a fiction book which is good for kids my age and up. My favorite character in the book, The Phantom Tollbooth, is Milo. Milo is a boy who gets an envelope that has a map to the Tollbooth. When he first starts his journey he is very depressed because he never knew what to do. The reason why Milo is my favorite character is because he is able to see things he has never seen before during his Journeys. During his journeys, Milo meets a watchdog named “Tock” who eventually becomes his friend. Milo becomes less depressed because he now has a companion and doesn’t have to feel alone. Another person Milo meets on his journey is Dr. Discord. Dr. Discord is an expert on bad sound. Dr. Discord tells Milo that if all sounds are good then everything would be so plain. If good or bad sounds were the only sounds people could hear, sounds would be monotonous. By Milo running into Dr. Discord he became less wearisome about the world. So far in the book, he has learned more and more about himself by the characters he has met during his journey. I agree Milo has learned more about himself. Milo is not a Milo anymore, he's a... smart person now? Or is he not? He has obviously changed and there is a line on page 233 that says that Milo says "but there is so much to learn". Milo was the exact opposite in the first chapter. Milo also doesn't think the phantom tollbooth is a game anymore too. You are all over this Noah! Great job to notice that line and see the change in Milo. So, which character, of all our books, has changed the most? My favorite character in the phantom tollbooth is Alec Bings. He is my favorite character because he taught Milo a very important lesson to look in every thing's point of view. Like an ant's point of view to a bucket of water or and elephant's to a bucket of water or just a person's point of view to a bucket of water. So also respect others point of view because their way might be better. My point of view is that Alec Bings taught Milo the most important lesson so far in the whole book. One of the reasons Alec Bings is my favorite character is because of the lesson he taught Milo about points of view. My favorite character in "The Phantom Tollbooth" is Alec Bings. He is a floating kid who can't see what's right in front of him, but only what's right in front the object in front of him in his family you are born floating in the air and grow down. For example if you were five feet above the ground you would grow closer to the ground, and eventually stop floating. Alec Bings taught Milo that everyone and everything has a different point of view. He teaches Milo that an ant would see a bucket of water as an ocean, and a human would see a bucket of water as a bucket of water. As Alec Bings gets old he never loses his point of view, and never grows up. So far I think Alec Bings has been the most interesting character in the book. Alec Bings is my favorite character too. I think Alec Bings is the most interesting character in the book also. When his older brother was born, his parents (which were also watchdogs) named his brother Tick when he went “tock,” “tock.” When his parents went to change Tock’s brother, it was already too late so they gave up having more children. In a Conclusion I like Tock as my favorite character in Phantom of the Tollbooth. I also like how Tock goes "Tick Tick" instead of "Tock Tock." I like Tock but he's not my favorite character. My favorite character in "The Phantom Tollbooth" is Tock. He is my favorite character because of his title: Tock the Watchdog. This is because of the... growth on his side. This is actually a clock. He is part of the watchdog family, whose purpose is to make sure that people don't waste time. The fact that Tock is a "watchdog" just shows Norton Juster's ability to think outside the box. What he taught Milo was that time shouldn't be wasted, as it was as precious as gems and gold. Milo met Tock during his confrontation with the Lethargarians. Tock became a form of a trusty sidekick for Milo, as he gave him advice during the beginning of their friendship. Tock is truly my favorite character, as the previous evidence has suggested. I bet time to Tock is more precious than numbers to Mathemagicion. I agree that Norton Juster was very clever of making Tock a watchdog. A lot of people did Tock as their favorite character, but they are totally diffrent. Great parallel in your comment Michael! My favorite character in The Phantom Tollbooth is Tock. Tock and I are both very interested in time. Without time, everybody would be late for everything! I also like Tock because of his personality. I like how he can come up with a quick and fun reply to almost everything people say. He is a dog, and I enjoy dogs, especially ones with interesting names. Tock’s name could mean a clock going “tock, tock, tock.” It could also mean talking, because he talks. Tock has taught Milo to use time wisely and to never waste time. That is very good advice. Sometimes I waste time doing nothing when I could be doing something really fun. When Milo met Tock, he was trying to get the Lethargarians to stop wasting time. Tock was furious when he discovered that Milo was killing time! I also think it's funny when Tock's alarm goes off when he's angry. By far, my favorite character in The Phantom Tollbooth is Tock. How come a ton of people like Tock. Right before I started typing I was wasting time. I like dogs also. Even my own crazy junkyard dog. Shame on you for wasting time! A ton of people like Tock because he's funny, clever, and he DOESN'T WASTE TIME! You shouldn't worry if I was wasting time. I was only wasting time for about 15 minutes. Okay, I'm sorry. Alec Bings is pretty cool, too. I liked your post, Michael! I guess the question is: Was it your time to waste? It was not Milo's night to spend, we found out earlier today! I have a question for the Terrible Trivium. If he sits around not doing anything, well except petty worthless tasks then shouldn't he belong or work at the Dolddrums? It even said Humbug enjoyed doing a job that requires no thinking at all! Then again they are actually doing something. Good point, Noah, but he is a demon so you know where he has to live . . . There are a lot of really fun characters in The Phantom Tollbooth that I like, but my favorite is Tock. Tock is a watchdog. When I say watchdog (for people that haven’t read the book) you probably think that Tock guards something, like watchdogs do. You’re right! Tock guards time. He has a huge watch on his side, and every once in a while, he has to wind himself. Tock’s alarm goes off whenever he’s scared or mad. I like Tock because he is funny and smart and makes sure that no one wastes time, which is very valuable. Tock also happens to like automobile rides. Milo (the main character) met Tock in the doldrums. The doldrums are very dull and boring, and the little creatures that live there (Lethargarians) do pretty much nothing all day. To Tock, time is very valuable, and now it is to me too. Tock taught Milo that you should never waste time, and that words are only confusing when you use a lot to say a little. Tock also told Milo that killing time is worse than wasting it. You might be wondering why a dog that goes tick tick tick all day is named Tock. According to Tock, “It’s an old story and a sad one.” When Tock’s brother was born, his parents, in joy, immediately named him Tick. On first winding him though, they found that instead of going tick tick tick, he went tock tock tock. They rushed to the Hall of Records, but it was too late. The name was already inscribed, and they couldn’t do anything about it. When Tock was born, it seemed logical that all their children would make the same sound, so they named Tock Tock. So now Tock is called Tock because he goes tick tick tick, and Tock’s brother is called Tick because he goes tock tock tock. Tock’s parents were so overdone that they gave up having any more children and dedicated their lives to doing good work among the poor and the hungry. Tock became a watchdog through tradition. His family had always been watchdogs-from father to son, almost since time began. There used to be no time at all, and everyone thought it was terribly unfortunate. They never knew when they should eat, and they were always missing trains. When they begin to count all the time available, there seemed that there was so much of it that the general opinion was “If there is so much of it, it couldn’t be very valuable.” Watchdogs were given the job to make sure no one ever wasted time again. In conclusion, Tock is my favorite character in The Phantom Tollbooth. You got a pretty good chunk of text there! Good job! You made me laugh, Miles! Sophie your comment is very detailed and even though it is huge (or as Miles said a huge chunk of text) it is very easy to follow! I like Tock too and I like him because he can be funny at times. My favorite character in The Phantom Tollbooth is the Humbug because I think his stupidity makes him funny. When the Dodecahedron gave Milo, Tock and the Humbug a math equation asking which group arrived at its destination first, Humbug blurted out "SEVENTEEN!" That made no sense and I thought it was really funny. The Humbug also tries to take credit for things he didn't actually do. For instance, the Humbug took credit for saving the Valley of Sound even though Milo actually saved the valley by releasing all the sounds from the Sound Keeper's fortress. Milo found the Humbug in the word market when he was talking to the Spelling Bee. The first time they met the Humbug taught Milo that history is full of humbugs which means they are impostors or frauds. I found the Humbug to be a very entertaining character in the book. At first I literally thought Humbug was smart, but it turns out he's pretty dumb! This character is a young boy like Milo who can see right through almost anything, from whatever’s inside, behind, around, covered by, or subsequent to anything else. The character I’m thinking of taught Milo that it’s all in how you look at things and that everyone has a different point of view. This character is called Alec Bings, and doesn’t really go by another name. After leaving Dictionopolis Milo, Tock, and the Humbug came face to feet with Alec. Instead of growing from the ground up, he grows from up to the ground. When Milo met him he was in Point of View. Alec Bings is my favorite character too. Yes he's a pretty cool kid Alec Bing, pretty cool. First off let me say that this is not my actual assignment, I already did it. I also wanted to say that as I read through all of these Blogspot posts, I realize that there are so many different characters from the beginning of the book that I forgot about! My favorite character in the "Phantom Tollbooth" is Tock. Some of the reasons I like him are that he is kind (although he has a very strong displeasure in wasting time) and he is willing to help anyone (provided that person does not waste time). I find it funny that his life is a little ironic... although his name is Tock he always goes "tick tick tick tick tick." When I first found out that Tock was a watchdog, I was curious to find out what he guarded... but it turned out he didn't guard any thing at all! It turned out he was literally a "watch" dog with a large watch attached to the side of his body! Although there were many wonderful characters to choose from, I'd consider Tock to be my favorite character. I agree with Miles, and it was kind of all the characters that didn't make sense too!